Each passing week American Horror Story: Apocalypse reveals more and more familiar faces, and this week's "Boy Wonder" episode was no exception. Crossing heavily into the Coven side of things, fans were reintroduced to some of the witches that had yet to resurface in the season. But the excitement surrounding these introductions aren't the only crazy moments from the latest episode. From the Rubber Man to basis of Ms. Mead's personality. Below we're breaking down the wild events in "Boy Wonder" from those exciting returns to the downright creepy Michael Langdon (Cody Fern). Since the announcement of this season's crossover it's been a waiting game for fans of past characters such as Coven's witches. While it only took a few episodes to meet Cordelia (Sarah Paulson), Madison (Emma Roberts), Myrtle (Frances Conroy) and Zoe (Taissa Farmiga) viewers had to wait a little longer for Queenie (Gabourey Sidibe). But in this week's installment, none other than Misty Day (Lily Rabe) and Stevie Nicks returned for a truly iconic reunion. 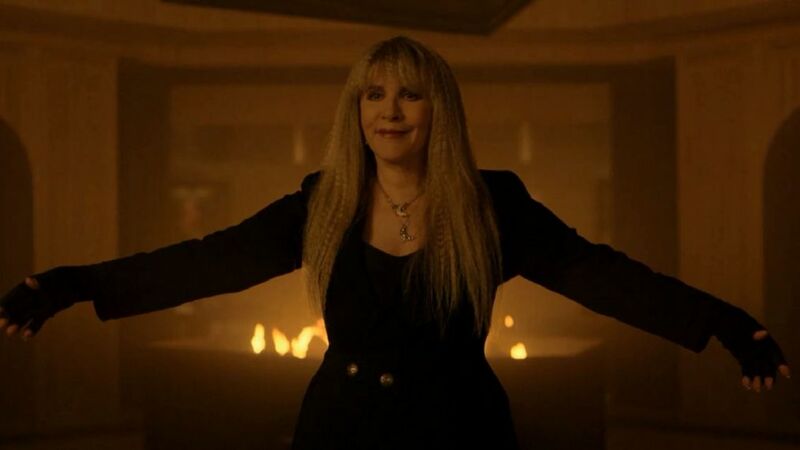 After being plucked from hell Misty is welcomed back by her fellow witches but Cordelia surprised her by inviting "The White Witch" Stevie Nicks to welcome her. Needless to say it was a reunion laced with loads of nostalgia. The actress is reprising her role as Constance Langdon. A true gypsy at heart — Misty Day's love for Nicks was basically a given. The girls bonded over their love for the earth and its creatures so it was truly exciting to see the songstress honor Misty's return with her Fleetwood Mac song "Gypsy." We've seen glimpses of Michael's evil side, but this episode featuring a past timeline reveals how the witches were connected to him and we see how ruthless he can be. During his journey to hell to retrieve Misty, Michael guts the science teacher who is part of her own personal purgatory. Later, Misty relays that during her retrieval Michael communicated with the projections there and sensed darkness in him. Meanwhile Michael also revealed his darkness in a fleeting glance to warlock John Henry Moore (Cheyenne Jackson) spooking him enough to try and prove his theory about Michael's true nature. Ryan Murphy's next creation is a 'Murder House'-'Coven' crossover. Ultimately, Michael had Moore murdered by Mead (Kathy Bates) to continue his course to power even garnering support from Ariel Augustus (Jon Jon Briones). But Michael's ascension to power is hard to watch knowing where the world will end up. Cordelia finally agreed to allow Michael to take the test of "The Seven Wonders" — a test so brutal that death isn't out of the realm of possibility but Michael excels much to his fellow warlocks' pleasure. When he's conquered the test Cordelia has no choice but to name him Supreme, but Misty's warning gives her pause. Cordelia knows Michael isn't quite good, but she reveals that his retrieval of Misty, Madison, and Queenie gives the coven an advantage. In a surprising reveal, fans learned that Coco (Leslie Grossman) is technically a witch, but she has one peculiar power — she can sense gluten. The reveal then launches into a lengthy scene in which Coco smells baked goods for Beverly Hills women to let them know if there's gluten in any of it. The moment is certainly one of the lighter moments of a darker episode. Plus, the stars of 'Ozark,' 'The Marvelous Mrs. Maisel,' 'Crazy Ex-Girlfriend,' and others. During Nicks' song, Cordelia and Madison slip out of the room and discuss Michael, unbeknownst to them Behold Chablis (Billy Porter) is listening just outside the door until he enters. When he reveals he heard everything about their investigation into Michael he says he has his own doubts and wants to help. So with Cordelia's help she gives them the location of where to begin their search — the house "where it all began." The moment serves as a nice segue into next week's highly anticipated return of Jessica Lange. Until then, we'll just be listening to "Gypsy" on repeat.